FOR ALL THE LATEST INFO PLEASE HEAD TO THE CLUB NEWS PAGE. Social Clubs and Corporate Groups are most welcome to enjoy a game of golf and our friendly atmosphere, with BBQ area and bar open to all. please use the contacts page for bookings or enquiries. 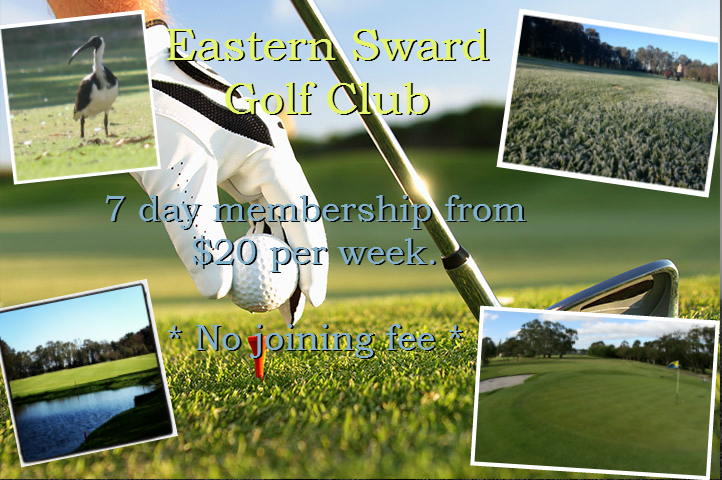 Welcome to the Eastern Sward Golf Club. The Sward offers golfers of all abilities a worthy challenge and an enjoyable round. A flat, tight course of just under 5000 metres with shaped and manicured fairways. Along with the assortment of lakes and sculptured bunkers dotted throughout the course, it is always attractive to the eye. The tight fairways are protected by plenty of trees, ensuring most bad shots will be punished to some degree. Although short in length, every tee shot is a challenge of its own. Smart golf will always be a match for the “grip it and rip it” brigade at Eastern Sward.